Ready for Fall? 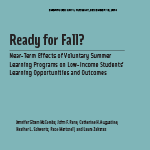 Near-Term Effects of Voluntary Summer Learning Programs on Low-Income Students’ Learning Opportunities and Outcomes (2014) This report presents the first set of student outcome findings from The Wallace Foundation’s Summer Learning District Demonstration Project, a six-year effort looking at whether and how large-scale, voluntary summer learning programs led by public school districts can help improve educational outcomes for children in low-income, urban communities. The study examines the near-term impact on students of their participation in a summer learning program over one summer; it finds improved student performance on math assessments and no effect on assessments of reading. Supplemental materials to the report include a video in which the project and early results are described and a Wallace Knowledge in Brief summarizing the near-term findings. More Than the Sum of Its Parts (2012) This book is an exploration of how arts organizations in communities across America are increasing access to, multiplying the benefits of, and sustaining quality arts education through large-scale, cross-sector collaborations focused on collective impact. The book provides insights into how organizations across the country are making arts education a civic priority while keeping young people and creative arts learning at the center of their missions. 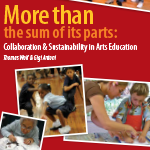 The presentation is based on the book, More Than the Sum of Its Parts: Collaboration & Sustainability in Arts Education, co-authored by Thomas Wolf and Gigi Antoni. 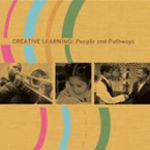 Creative Learning: People and Pathways (2011) This report synthesizes the research and evaluation collected and analyzed between 2006 and 2010, and is one of three companion documents. Two detailed studies, Paving High-Quality Learning Pathways and Developing Creative Capital in Children and Families provide deeper exploration of the learnings presented in this report. Together, these reports provide an in-depth look into the wide-ranging, complex world of creative learning in Dallas. 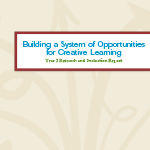 Building a System of Opportunities for Creative Learning (2008) The objective of Building a System of Opportunities for Creative Learning is to communicate Thriving Minds’ research findings and activities carried out from its inception. The report was commissioned and produced by Big Thought, the nation’s largest, most successful nonprofit organization focused on improving public education through creative learning. Big Thought is the driving force behind Thriving Minds, a citywide education initiative that works with teachers, artists and parents to infuse educational experiences with opportunities for students to imagine, create and innovate. 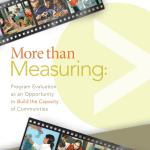 More than Measuring: Program Evaluation as an Opportunity to Build the Capacity of Communites (2007) How are arts education advocates first “making the case” for the centrality of the arts in a public school education, and how are they building understanding and commitment among their communities? More than Measuring provides the story of how these questions were answered in Dallas, the 12th largest public school system in the United States, with over 163,000 students and 6,000 teachers. Enriching Minds. Growing Our Future (2006) According to a long-term study conducted in partnership with the Research and Evaluation Department of the Dallas ISD and the Annenberg Institute for School Reform (AISR), ArtsPartners adds great value to the education of our children. The study followed two groups of Dallas students. The first group (Focus) participated in intensive ArtsPartners programs for up to four years. The second group (Control) received only a modest level of ArtsPartners services. Reviewing the findings of this study, it is clear that ArtsPartners has ignited, enriched and fueled student learning throughout the community.